Welcome to FUSION!!! Lesley Croghan and Jackie Rockwell here and we are excited to launch our brand new card making challenge blog!!! We have been putting together some challenging and hopefully inspiring challenges to get your card making Mojo all revved up! We will be launching our first experiment on Friday, April 5th at 9am (PST)! We hope you will join in the fun!! To get the beakers boiling and to start our hypothesis right now, we are having a little FACEBOOK contest . 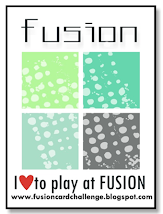 . . please LIKE our FACEBOOK page and let us know whether or not you would be interested in being a guest designer for FUSION. Would you be interested in designing for an inspiration photo, a sketch or combining both to create FUSION. Please be sure to add the link to your blog in your FB comment. Thank you!